The Charity, Hempstead Village Hall, as it is now constituted is the result of a merger in December 2010 between Hempstead’s Village Hall and Recreation Ground Charities following both trustee groups requesting the Charity Commission to bring them together under a single group of managing trustees. The Charity is registered with the Charity Commission as a non-exempt unincorporated small charity for the benefit of the inhabitants of Hempstead Village and its near neighbours. The foundation of the Village Hall Charity dates back to 1946 when Mr Geoffrey Garrett, a former resident of Hempstead, gifted a plot of land situated on the western side of the High Street into a trust for the site of a village hall for Hempstead inhabitants. This site for the village hall was short lived, however, when in 1952 during the initial planning for a suitable building to be erected on the site the Hempstead Church of England Village School came up for sale and the trustees of the day acquired the redundant school and sold the gifted land to help fund the purchase. 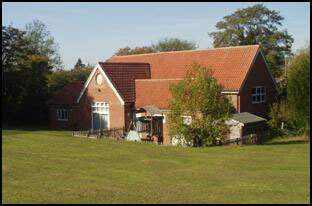 Since its acquisition the old village school, now the Village Hall, has had a number of updates and additions. Initially to convert it internally from a school to a village hall and later, in 1972, extended to include an entrance hall, kitchen and toilets. Following Village fund raising activities a major refurbishment and extension programme was carried out in 1999 greatly assisted by grants from the National Lottery Charities Board, Essex County Council, Essex Environmental Trust, Uttlesford District Council and Hempstead Parish Council, this £150,000 project created the up to date Village Hall facility that stands today. The improved facilities that the millennium development had introduced led to a decision being made by Radwinter Pre-School to base themselves here since 2001. A Pre-School Play area was added in 2008 and a patio in 2013 completing all the functions that the hall requires. We continue to invest in and upkeep this important village asset and modernise it as necessary, i.e, with Broadband added in 2018. The area of land directly behind the Village Hall, locally known as The Glebe, which had for a number of years past been used for allotments and a general play area, was in 1987 purchased by Hempstead Parish Council from the Church of England Commissioners and put into a trust for the benefit of the Village. Its trustees, four Parish Councillors at the time, subsequently registered the trust with the Charity Commission as the Hempstead Recreation Ground Charity. These initial trustees remained the Recreation Ground trustees until its merger into the Village Hall Charity and the Hempstead Recreation Ground Charity closed. The object of Hempstead Village Hall Charity is defined in its governing document as the provision and maintenance of a village hall and recreation ground for use by the inhabitants of Hempstead. Which is much the same as those decreed in the original trust deed of 1946 with the addition of amendments as required by law and the inclusion of a recreation ground in its objects. It is administered by a Management Committee of eleven members who are its managing trustees. Organisations of Hempstead Village nominate seven members and four members are elected, all are appointed at an Annual General Meeting held each October for a period until the next Annual General Meeting. Hempstead Parish Council is the Charity’s custodian trustee and holds the title of Village Hall and Recreation Ground in trust on behalf of the Charity’s managing trustees. For the Charity’s financial status and current trustees as reported to Charity Commission please click here.